Roaring Brook Press. 2013. 53 pgs. In 1968, antiques dealer Jim Carpenter made a discovery of a lifetime. Responding to a request, Carpenter visited “Ojo’s Junk Yard and Machine Shop” run by Ojo and Leo Ohr. Stored in cartons were over 5,000 pieces of pottery made by their father. George Ohr, an eccentric Biloxi potter, insisted that someday his pots would be worth their weight in gold. Fifty years after his death, it looked as if his words might come true. Born in Biloxi, Mississippi in 1857, George Ohr always felt the odd man out, especially with his family. Suppose five hen eggs were put under a brood and somebody somewhere made a mistake and got a duck egg in the job lot…I’m that duck and no fault of mine. After sampling over fourteen low-paying jobs, at twenty-two Ohr discovered his passion…the potter’s wheel. Jan Greenberg and Sandra Jordan have, once again, penned another distinguished book about art. (Ballet for Martha: Making Appalachian Spring. 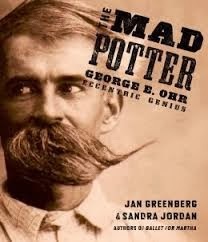 2011 Sibert Honor Book) Illustrated with historical photographs and color reproductions of Ohr’s thoroughly creative ceramics, The Mad Potter tells the story of an individual who never stopped believing in his dreams. Back matter includes the creation of the Ohr-O’Keefe Museum of Art in Biloxi, Mississippi, instructions on how to look at a pot, directions for make your own pot using a potter’s wheel (And How to “Boss” One of Your Own (As George would say)”, bibliography, source notes, and picture credits. Click here to vsit the author's website.